Watch & Wares has been a brick & mortar business in California for over 30 years. Throughout this time, we’ve bought and sold more estates, jewelry, fine watches, diamonds, fine art and collectibles than many competitors combined. Due to our long-lasting relationship with most of our clients, we are also a well-known Orange County estate buyer, working with families in their time of need from all over Southern California. 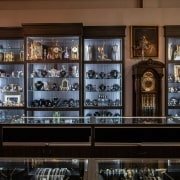 Our Owner, William Houchin has spent the last 3 decades of his life collecting the finest vintage, antique, designer and estate jewelry & fine watches in Orange County & surrounding areas. Because of this, when people ask the experts where to sell their family estate or liquidate assets in Orange County, most in-the-know refer William at Watch & Wares. We pride ourselves in doing business securely and discreetly with all of our clients. We’ve served as the Orange County estate buyer for some of SoCal’s wealthiest patrons. Because our number one goal is integrity, we work hard to ensure customer satisfaction with each estate we purchase. We offer personalized attention to detail, whether we’re dealing with the family of a recently deceased loved one, or working with their attorney or another agency. We understand that selling your family’s estate and prized assets isn’t easy. Due to the nature of most estate liquidations in Orange County, we understand you may be dealing with a lot and are under a lot of pressure. During this trying time, our experienced Orange County estate buyer will visit with you personally and present you with a cash estimate for your estate and valuables. Because collecting is our passion, we’re able to work fast and provide you with values you can trust. What Types of Items will our Orange County Estate Buyer Buy? William is one of Orange County’s most well-known buyers of precious metals, estate jewelry, loose gemstones, diamonds, fine watches, collectibles and fine art. From valuable classic cars to high-end diamond collections, Picasso paintings and antiques from several eras — we buy it all! Furthermore, we leave no stone unturned — we’ll help you identify & price your loved ones valuables quickly. Because it may difficult to know if you have a valuable piece within your collection, simply give us a call and let us help you identify your assets. Signed Pieces such as Tiffany & Co.
Fine Watches & Swiss Timepieces, including Rolex, Cartier, Patek Philippe & More! Rare Coin Collections, as well as Autographs & Memorabilia + More! Questions About Selling Your Estate in Orange County? Call Us and We’ll Help! Because we know that time is of the essence, give us a call and we’ll walk you through our simple process. Our Orange County estate buyer will help you walk through your estate assets. We can set a convenient time to meet, either in our safe & discreet store located in the Orange Circle (Plaza), or we can come to you! Due to the demand for William’s work as an Orange County estate buyer, we work quickly & diligently to ensure our we offer top values for luxury assets. Furthermore, if you’d like more info about the types of items we buy, or whether your estate would qualify for purchase, simply give us a call or send us a message using the handy contact form on this webpage! Call Watch & Wares at 714-633-2030 & Get a Free Estimate Today! Finally, click here for a link to some of the other luxury items we buy in Orange County! You can also read what others are saying about us, due to our sterling service & reputation on Yelp!